Banpresto’s Aquapict Jellyfish led light has been a huge hit in Japan.Â Its sort of a mood light made from virtual aquarium that needs no attention. 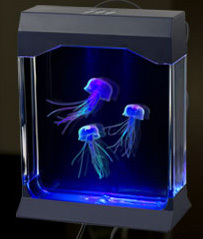 You just turn it on and three very lifelike jellyfish made of silicon randomly float around. Each aquarium contains 12 different colors of lights. After two hours, it automatically turns itself off and awaits its next use. The instructions, in Japanese, are relatively easy. Fill the tank with water to the marked level, soak the jellyfish in water for about 30 minutes (do not touch them), put them in the tank (do not touch them), put the lid on the tank, plug it in. The tank holds about 1.5 liters, has a mirrored bottom, a black background (card) you attach to the tank. It also comes with an instructional DVD and a small paddle to push the jellyfish around if they get stuck to the side. Its about 27cm X 21 cm X 12 cm in size. where do i get one? in the usa? i dont like this. It ISNT virtual …like the jell-o! !